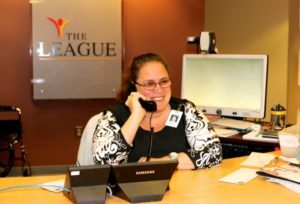 Anne Palmer works the front desk at The League in Fort Wayne, Indiana. The league is a not-for-profit agency that offers services to assist people who have disabilities in living independently in their home and community. They have many services such as orientation and mobility (O&M) training, independent living skills training, information & referral services, adaptive equipment services, braille services, interpreting services, and more. I went to visit Anne at The League to learn about the assistive technology she is using so she is able to work the front desk. I got there early and Anne had not arrived yet so I sat in the lobby and watched all the activity at the front desk. When Anne arrived, she wheeled a cart into the reception area and greeted me with a warm smile and told me to come sit back with her as she got set up to begin her shift. Anne positioned her rolling cart next to her chair at the reception desk. The cart had a desktop magnifier on it that she needs to read mail because she has a visual impairment. I sat with her to observe her do her job and to learn about the assistive technology evaluation and training she received through Easterseals Crossroads. Anne was busy signing in people who were gathering for a meeting and answering a very busy phone. As I was observing Anne work, I began to see how personable she is and how much she likes to joke around with staff and visitors. She greeted everyone with a big smile or and some teasing. She was joking with someone who was checking in and she told me, “It’s my job up here to give everyone a hard time” and then smiled. She brings a smile to every single person she encounters while I spend time with her. Anne’s responsibilities at the League are to greet visitors and sign them in, to answer the phone and route the calls to the appropriate department, and process the mail. 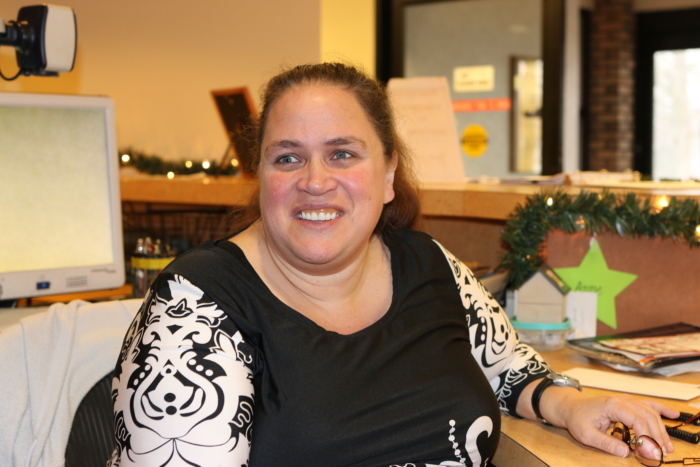 She is able to do many of the job duties she has because of assistive technology that she has received as a result of the assistive technology evaluation she had through Easterseals Crossroads. When things settled down a bit, I learned a little about Anne’s life. I learned that she was born in Chicago, Illinois and went to grade school in the suburbs of Chicago. She lived in that area until her mid-20s when she got married and moved to Indiana. She now has 4 boys who are grown and 3 grand children. Anne told me she was born with a visual impairment. In kindergarten and 1st grade she went to mainstream schools but they weren’t familiar with working with people with visual impairments so she spent 2nd grade at a school that focused on encompassing people with disabilities. It was here she was connected with a program that had individuals who would volunteer to help kids with disabilities in their school. She then went to mainstream schools for the rest of middle and high school and continued to have the volunteers help her at school. The volunteers taught her how to use large print books and how to use a magnifier sheet to magnify so she could read printed material. They would read aloud to her and assist her with studying and taught her how to type. Anne graduated high school and took 1 year of general education classes. She then got married and had children and stayed home to care for her family. When she moved to Fort Wayne, Indiana she got connected to The League so she could learn more about computers. Once she learned computer skills through The Leauge, she then talked to her Vocational Rehabilitation counselor and told them she felt prepared to go to school. Anne started as a volunteer at The League and then got hired. As she was getting more responsibility, she needed assistive technology to assist her in her job tasks. Her Vocational Rehabilitation counselor referred Anne to Easterseals Crossroads for an assistive technology evaluation to determine what could help her work independently. An assistive technology evaluation is a one-on-one evaluation to determine the appropriate assistive technology to increase someone’s independence in the home, community, or workplace. Anne was assigned to work with Jim Rinehart, Assistive Technology Specialist, at Easterseals Crossroads. After meeting with Anne and evaluating her needs at work and school, Jim recommended that she get a DaVinci CCTV so she can read written material at her desk. The DaVinci is an all-in-one desktop magnifier. This magnifier will allow a user to magnify print up to 77x. It also has optical character recognition so it can use text-to-speech to read aloud what it sees on the screen. Anne uses the DaVinci to read documents and mail. 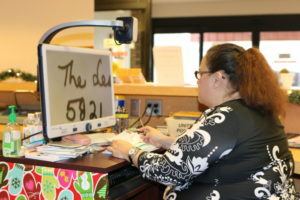 She uses it to assist in creating and proofreading the calendar she makes for the agency. She is also a support staff for The League’s board and she takes all the minutes and is able to use the DaVinci to proofread the minutes from those meetings. Jim also recommended the Victor Stream Reader, which is a talking books mp3 player and voice recorder for notes. Anne told me that the voice recorder has been very helpful at work and at school. She is able to take notes during meetings and then take the time to organize it where she wants at a later date. She said this has been a crucial piece of equipment in things she is responsible for such as the annual fundraiser auction. She is able to record names, addresses, and contacts of those who are participating and donating. Anne hopes to work with seniors when she graduates as an advocate and says her time at The League has given her a lot of great experience because she has been able to see the agency from all sides from using their services, working the desk, and being support staff for the board. With the help of assistive technology, she will continue to work at The League and go to school and continue to do both successfully. When Anne graduates, she will have not only the education and assistive technology she needs, but she will have experience in helping others and will be a great asset wherever she ends up. My bet is that wherever she does end up she will be working successfully all while cracking jokes and donning a big smile.